and on Bandcamp or NumberOneMusic. "Petunia" is our our latest piece, the first in the series in which we would like to present an alternative view of our band and invite other musicians to cooperate with us. The composition of Mariola Spiewak arranged by us together, in which the sound director Darek Grela also had his part, to whom we would like to thank for his significant contribution and commitment. It was recorded and produced in November and December 2018 (NLD Studio, Cracow, Poland) by Darek Grela. Percussion instruments are the work of Slawomir Berny. "Petunia" is a special dedication for Jadwiga and Stefan Paczocha. 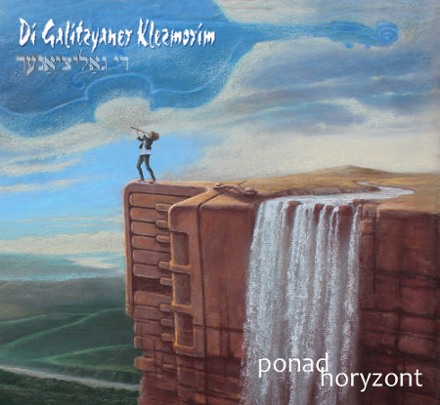 "With deep interest I have listened the recording "Over horizon" by Cracow group Di Galitzyaner Klezmorim. The CD is very interesting, great performance; I hope it will be met with big interest." We hope too. Our third album it's almost fifty minutes of music: the seven of our own compositions, three of which also contain the famous Klezmer tunes (including "Tantst, Tantst, Yidelekh" by Abe Schwartz) and one was registered in version with the orchestral accompaniment by Pawel Przezwanski. We recorded the first part of the material in February 2011, in Preisner Studio, Niepolomice. Registration of the second one, mixing and mastering a whole have been made in July and August 2012, in the NLD Studio, Cracow. Darek Grela had custody of all. The CD has been released by Tylkomuzyka.pl record company. PS: The title track along with compositions from previous albums were incorporated into to the soundtrack of a feature documentary "Raise the Roof" by Yari & Cary Wolinsky, which premiered during the open days of the Museum of the History of Polish Jews (October 2014) and was also presented at the Jewish Film Festival in Atlanta in February 2015.
klezmer band from Cracow became the prize-winner of the prestigious cultural prize awarded each year by the Council of Europe. (...) I could hardly believe it - says Rafal Seweryniak – when dr Ernst Seidel, one of the Secretaries of the Council of Europe informed me about that personally by phone. The speech day took place in Basle, in the decorous interior of old assembly hall of a local university. (...) One of the laureates decorated with the Cross of Merit "Pro Arte" was Sir Peter Ustinov, an actor, animator of culture, the man of great heart, (...) Sir Peter – says Mariola- despite the fact, that he was besieged by journalists and cameramen came to us behind the scenes, greeted us Good day in Polish and said few warm words about our music. We have really felt to be distinguished ones." "Galicia closer to Europe. Basle. 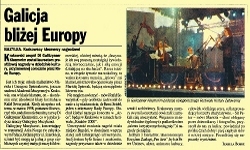 The Cracow klezmers awarded a prize"
The band in artistic creativity refers back to the tradition of Klezmer music. The musicians by personalising it entirely attempting in its own unique way to extract and underline only these features which are according to the artist the most important ones. Poetic and melancholic melodic interweaves with fervent and extatic spontainety creating the space filled up with the wide scale of colours and emotions. The classical and academic education cannot be omitted here as well. Virtuosity, the care for sound and detail in connection with great musical sensitivity give these compositions aesthetically refined shape. 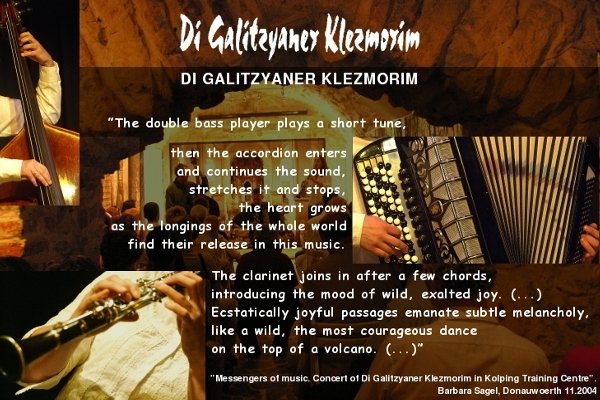 Apart from compositions based on original Klezmer melodies in the repertoire of Di Galitzyaner Klezmorim there are more and more their own pieces. the 1st prize in the "1st Chopin Open Competition for all instruments except the piano"
"There was something magical about it when my friend invited me to a Klezmer concert for the first time. I was fascinated even though I did not think that I could play it myself. This melancholy, ecstasy, this incredible rush of emotions, it all seemed unattainable to me as a performer then. A complete case decided that I found my fulfillment in this music." Graduated with honours from the Academy of Music in Cracow in 2000. While pursuing her studies, she developed a profound interest for Klezmer music. At that time she performed with one of the bands at Kazimierz, the former Jewish Quarter of Cracow. 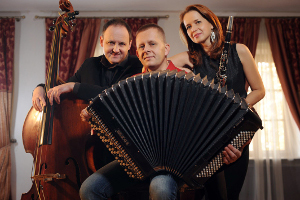 In 1996, her husband Grzegorz and she formed their own band, Di Galitzyaner Klezmorim. She wrote her master thesis on the history of Klezmer music. She has co-arranged the Mayority of pieces in the trio’s repertoire. "For many years I lived in Krakow in Kazimierz (former Jewish district). Every day I filtered through history, culture, the whole atmosphere and the spirit of this place. After some time, I realized that I would also like to express my feelings and emotions in Jewish music - Klezmer. I have been doing this for many years and I am still discovering it, it still surprises me and gives me much joy." Graduated from the Academy of Music in Cracow in 1999. He won awards in competitions both as a soloist and a chamber musician. He collaborated with one of the bands performing at Kazimierz. Later he co-founded Di Galitzyaner Klezmorim. He has focused on Klezmer music for a few years now, gaining remarkable experience in the field. He has arranged most of the ensemble’s repertoire. 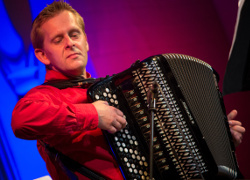 Since 1998 he has also been giving accordion classes in a secondary music school in Cracow. "The music we play gives me a lot of creative freedom. I can implement various solutions without any problems, especially in the field of articulation and sound, which would be out of place in traditional, conservative performance. I find here some analogies to the practice of performing Baroque music that has fascinated me for a long time. Maybe that's why our music together is so attractive to me." Graduated from the Academy of Music in Cracow in 1998. He joined Di Galitzyaner Klezmorim in the same year. Beside Klezmer music, his artistic activities focus on baroque music. He is interested in the historical performance practices and specializes in playing the baroque double bass and violone. 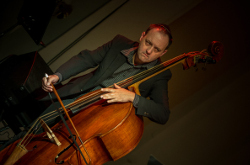 His master thesis was devoted to the history of double bass. He has perfected his skills in numerous master-classes (with the members of the Orchestra of the 18th Century) and summer courses (Summer School of Early Music, Warsaw). He performed with Cracow’s early music ensembles including Collegium Cracoviense, In Concerto and also cooperated with Capella di Ospedale della Pieta, Consortium Sedinum, Gaudium musicandi, Il Tempo. "(...) Inviting this masterly trio of soloists, whose fabulously congruous play evoked gasps of admiration from the audience, was an absolute hit. (...) Mariola Spiewak demonstrated all the nuances of the clarinet: melancholic sighs as well as unhindered joy and terrible shrieks, the music both as soft as velvet and as sharp as the sword. (...)"
"A fantastic final chord. 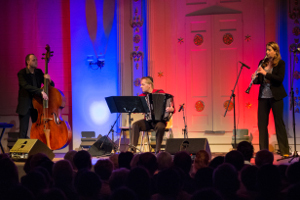 The series of concerts "Music in old village churches"
was closed with a performance of an exceptionally gifted Polish Klezmer trio"
"(...) The music is so good that no one should look around the town now. (...) Yiddish music of the highest quality. (...)"
"Extremely popular concert in "Summer in the City". 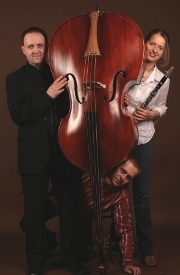 Cracow Trio made the day beautiful in Unterstadt." 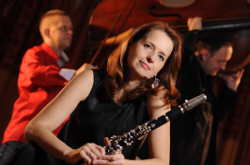 "(...) Mariola Spiewak turned out to be a talented clarinet player. Beside technical virtuosity, her nearly inexhaustible richness of modulation in all positions, with grace notes and glissandos, so typical for Klezmer music, evoked true admiration. Grzegorz Spiewak demonstrated great virtuosity, not only in the high range of his accordion playing but also in the bass register. 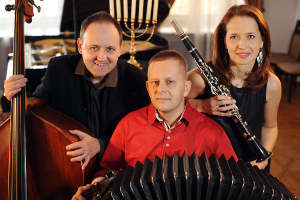 As the arranger of the trio, he has managed to invest traditional Klezmer sound with chamber music quality. Rafal Seweryniak, who plucked the gut strings of his double bass or applied the baroque bow to it, created not only the basis, but also occasionally influenced the musical action. (...)"
"(...) Their cheerful, merry music was far from what we are normally offered. (...) Mariola Spiewak must have made her decision to take up the clarinet under a really lucky star (...). Her whispering pianissimos, her fortissimos filling the whole concert hall, gentle sighs, gurgling, high notes, and virtuoso cascades of sounds made even the oldest listeners jump up from their seats and provoked cries of delight and admiration. (...)"
"Concert of Klezmer music in Rueckert School, Coburg, full of joy of life"
"(...) To say that Di Galitzyaner Klezmorim just embellish Klezmer music with new attire would be too gross a simplification. (...) The music they play smacks of bolero and tango, or reminds one of Debussy. While the accordion (...) sounds as the piano. Their perfection stems from their virtuoso play; alterations of tempo are staggeringly beautiful but the players still remember about conveying the mood. (...)"
Rather orchestra than dance combo - from shtetl into wide world"
"(...) Right after the first chords it seemed that the player, the instrument and the tune were inseparable. With her harmonious movements, fully engrossed in music she was playing, Mariola Spiewak managed to suggest to the audience her unification not only with the instrument, but also with the sounds. She demonstrated a whole range of her instrumental contribution to the music played by the band in an hour-and-a-half-long performance of raising and falling passages: playing shy, subtle bits before strong, forceful sounds that due to their force could have been confused with the sounds of the saxophone. (...) In a brilliant "conversation" among the double bass, the accordion and the clarinet, the musicians managed to convey to the enchanted audience the whole charm of Klezmer music (...) and the historical weight of the music whose ancient character seems so palpable. (...)"
March Poland Kazimierz Dolny appearance in an episode of a German-Dutch TV series "City Hospital"
May Kalisz European Year of Intercultural Dialogue. The Year of Israel in Poland. Bydgoszcz the 48th Bydgoszcz Music Festival "Chopin, Paderewski - artists of the world"
Krzeszowice The award ceremony of the Mayor of the Commune of Krzeszowice "Source of Success"
NOTE: It may happen that, for reasons beyond our control the concert will be canceled. preferably in the day of the concert, after 13:00h. There is also a possibility to organize a concert in another day and hour. Contact please Pro-Arts Artistic Agency.